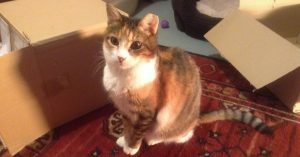 Zohra is a gorgeous older girl (12 years) who would like a quiet home. She loves her bed and her scratching post platform so she can see what is going on. 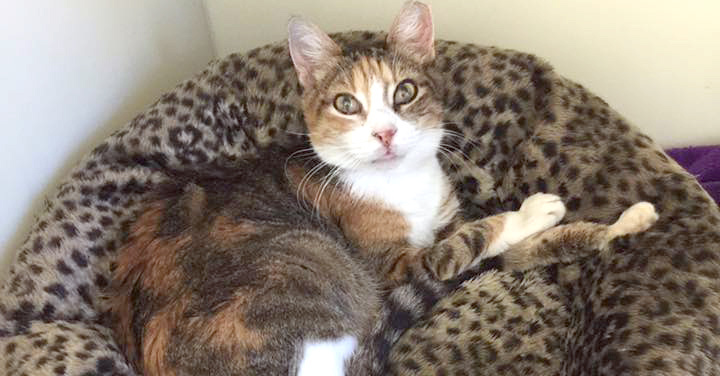 She enjoys a fuss and to be brushed and has a very soft purr for everyone she meets. She’d be happy to live with teenagers and adults and would be a loving pet. An update from Zohra’s new owner: Well apart from being a gorgeous girl whom everyone who meets her adores, she seems to have settled in nicely. She loves to play with cardboard boxes of all shapes and sizes, empty loo rolls, anything that moves basically. She also likes her beds whether they are the radiator bed in the photo, an unmade bed, my laptop, my kindle has become bendy too but most all she likes to lie across my head! Well it does help with keeping warm I suppose. She wakes me up in the morning and tells me when it’s time to go to bed. She’s trained me well! Thanks to the vet and her team, the gingivitis is being kept at bay and although the car journeys are stressful she does at least get to see her favourite vet assistant Tom who she simply adores. She’s a wonderful addition to my family. Best move I could have made. Thanks to BCDH.